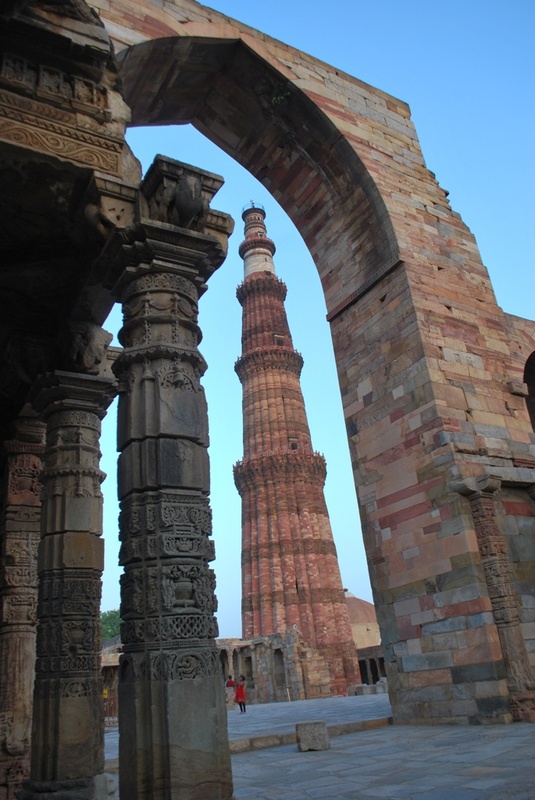 The Qutab Minar ( Minar is a tower in Hindi) is the symbol Of New Delhi and marks the Rise and Fall of dynasties and empires over 11 centuries. 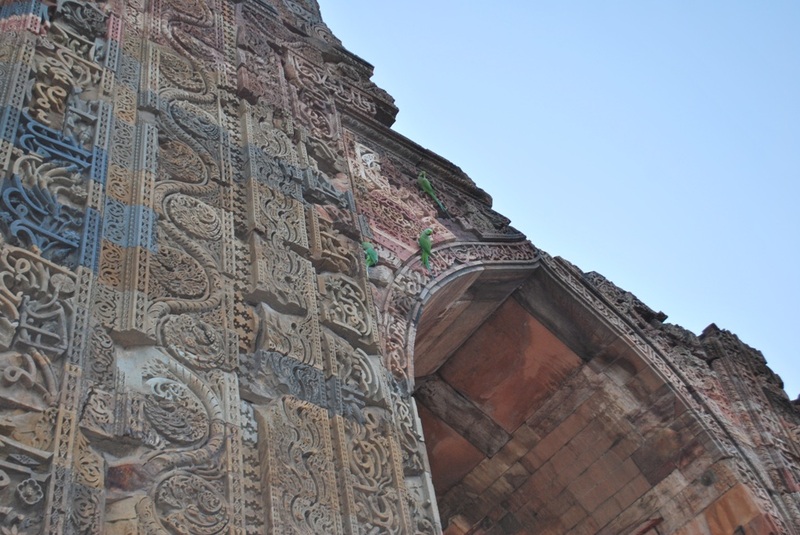 As I was arching my neck and attempting to frame ( photographers will get it) the magnificent Qutab Minar , the corners of my eyes detect specks of green on this gateway to the Iron Pillar ( 2nd Century BC) . 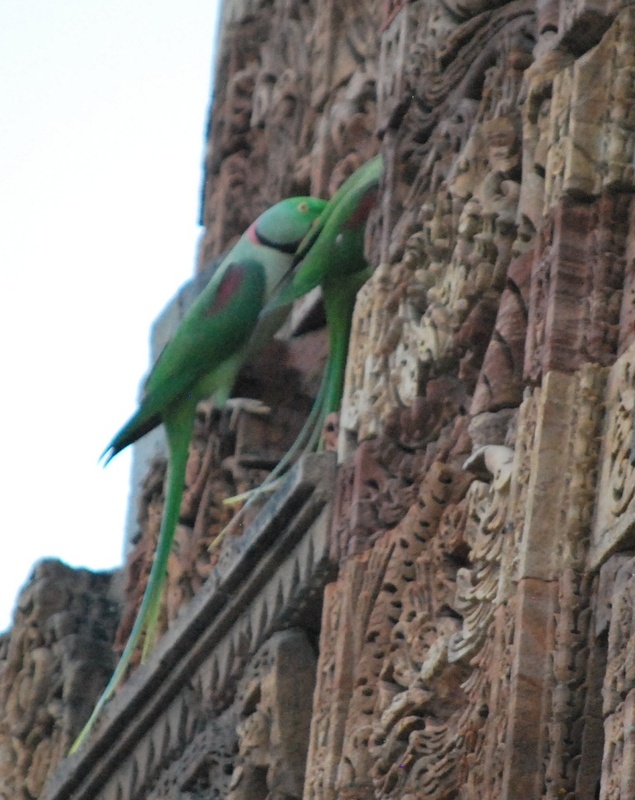 On a closer look , the specks of green turn into parakeets adorning the beautiful stone carvings. Am overawed and pleasantly surprised, they are none other than Alexandrine Parakeets. Psittacula eupatria. The red shoulder patch reveals the identity of the largest bird in the family of Parakeets . The male is distinctively identified by its red nape and black ring around the neck . This couple had found a gorgeous 1100 year old Penthouse . 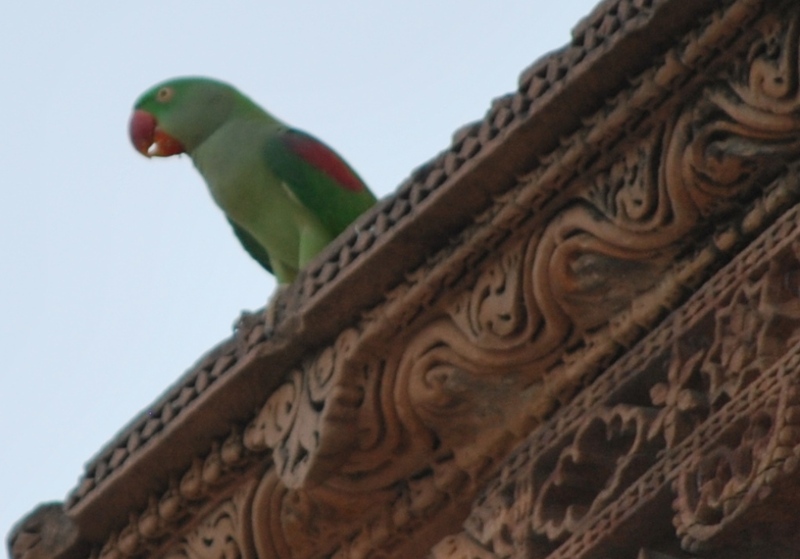 An alert female member of the Alexandrine parakeet looks at all from the rooftop perch of the Penthouse. Do notice the black ring and red nape are absent. It is also distinctively smaller than the male. 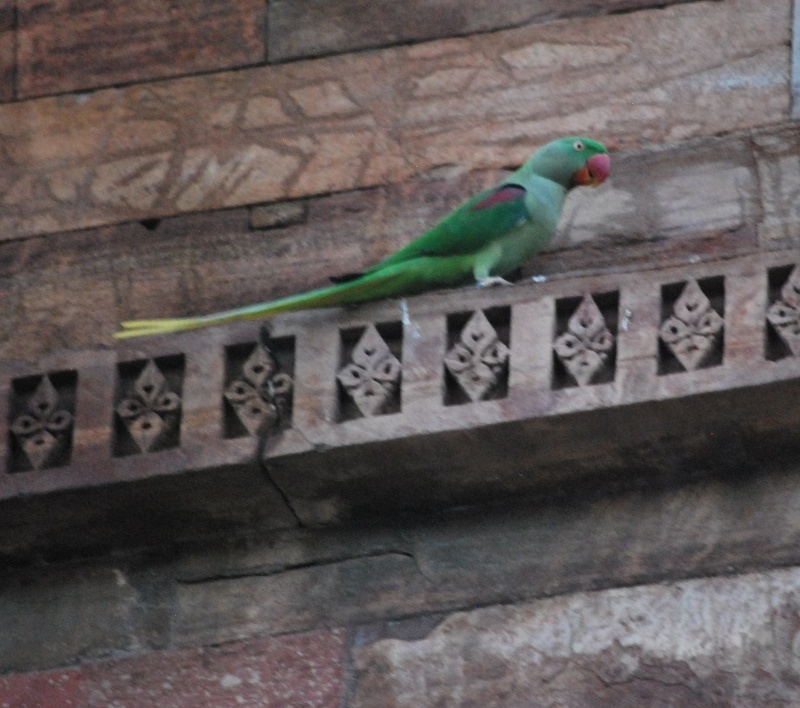 I understand from Wikipedia (https://en.wikipedia.org/wiki/Alexandrine_parakeet) that this native Parakeet gets its name from the great Greek Emperor Alexander the Great. 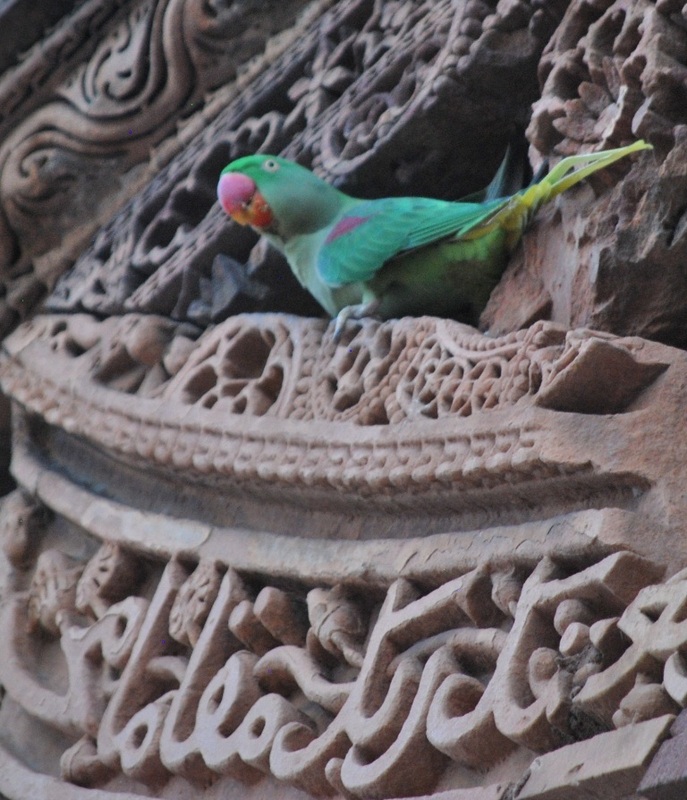 This elderly and very cross looking lady member of the family of Alexandrines inhabiting the Qutab Minar complex paces up and down the carved ledge. She seems to be upset with the incessant cacophony of squeaking and squawking created by the youngsters in the family. Suddenly she turns a full 90 degrees and peers right into the eye of the camera. Who are you taking pictures of ? It seems to be a foodie, has dipped into the cookie jar too, check out the tell tale remnants around the large red beak. The distinctive yellow tipped red beaks are a unique characteristic of this beautiful and very talkative Parakeet. 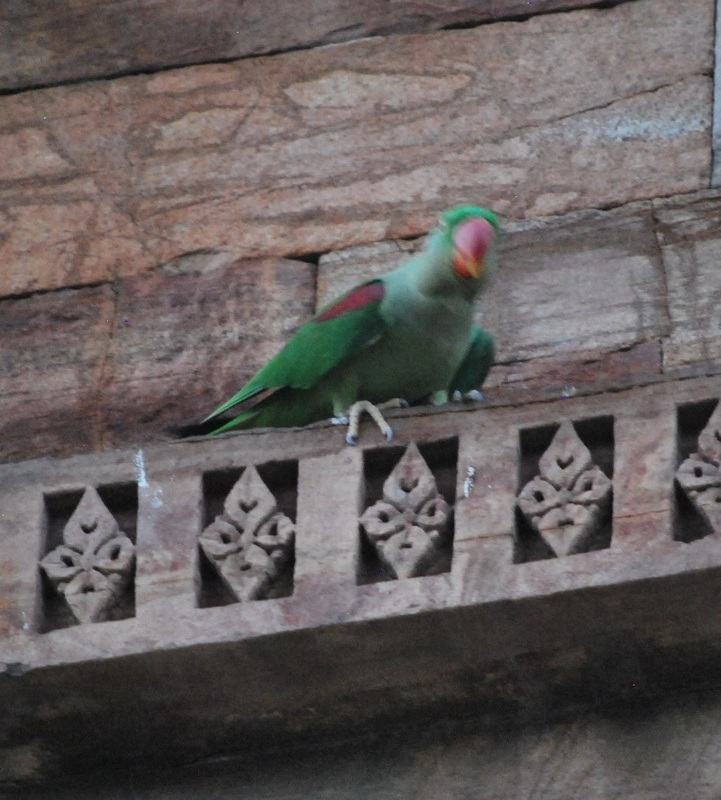 Do watch out for the red patch on the shoulder to identify the Alexandrine Parakeet. Apparently they were taken from North West India to Europe in 326 BC by the Emperor Alexander. The Iron or Ashok Pillar standing witness in the courtyard of the Penthouse also dates back to the same period over 2000 years ago. I loved the history lesson taught by the Alexandrine Parakeets. Did you too? A forest is a world of magical splendour. Nature can fire your imagination as the forests often Eclipse even the Mighty Sun. 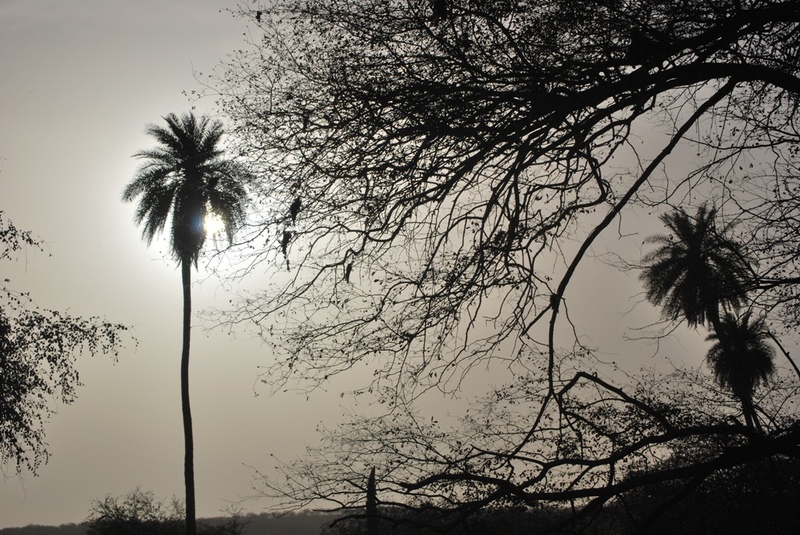 The trees stretch out their arms and turn themselves into shades of black . 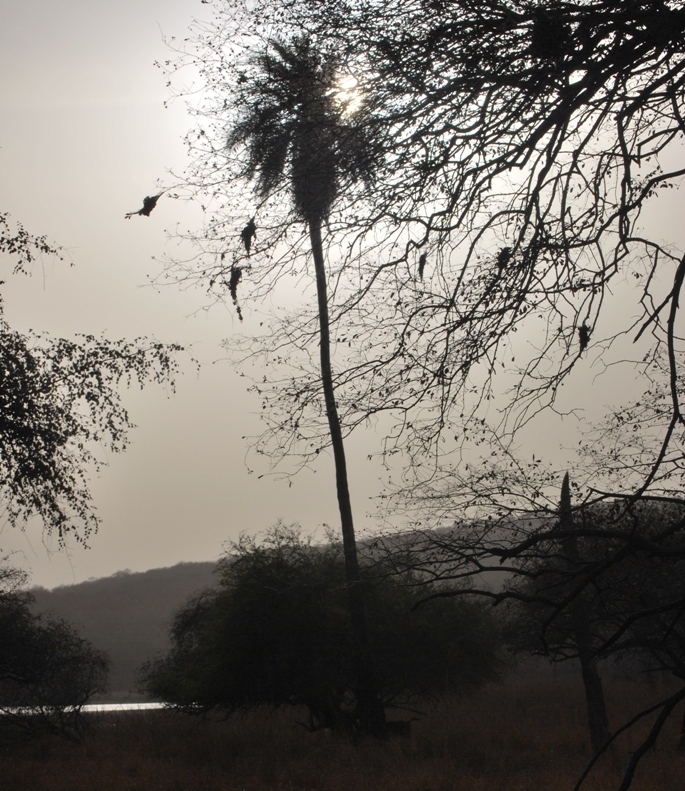 The lakes, mountains and the golden grasslands transform into shades of black as well. A cloak of darkness creeps upon this Enchanting Forest. 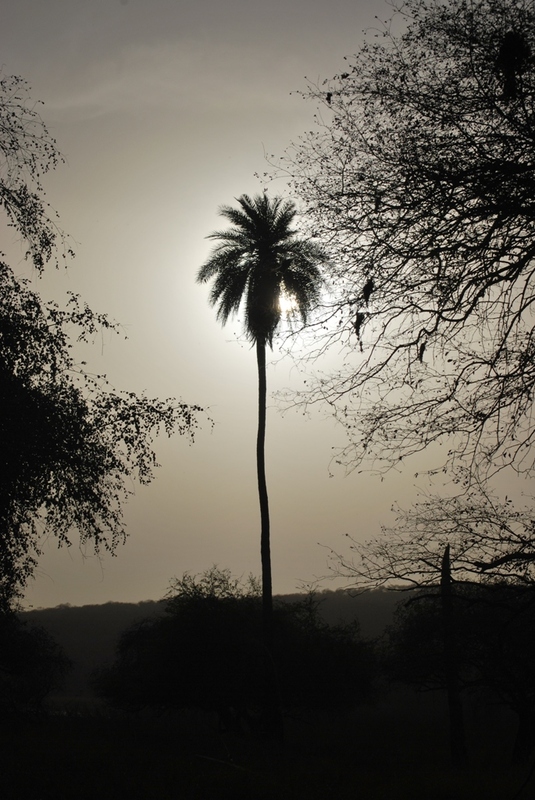 Within seconds the sun is eclipsed and a halo forms around the Crown of the Palm Tree. The forest plunges into darkness and all turns BLACK. Other trees struggle to reach out to the Sun and numbers seem to be on their side. The bigger denser trees seem to be stronger and the tussle seems to be going their way as the others recede. 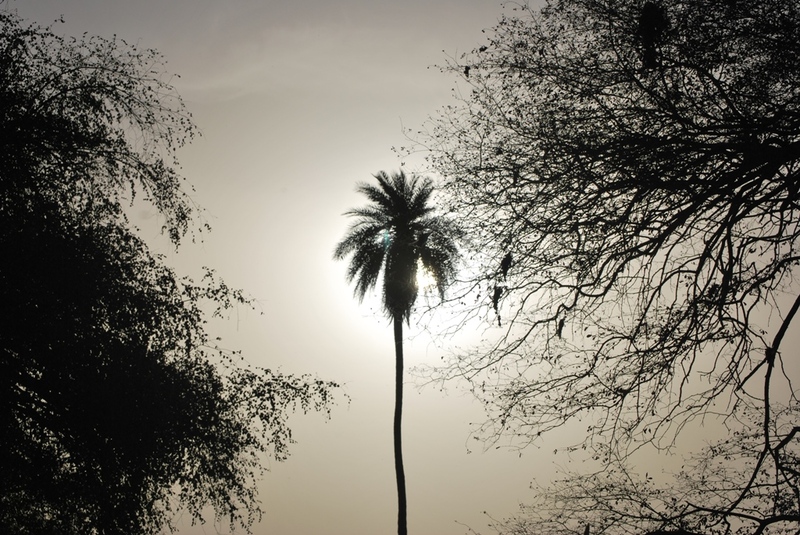 The Sun has however chosen the Palm Tree and balance is gradually restored. 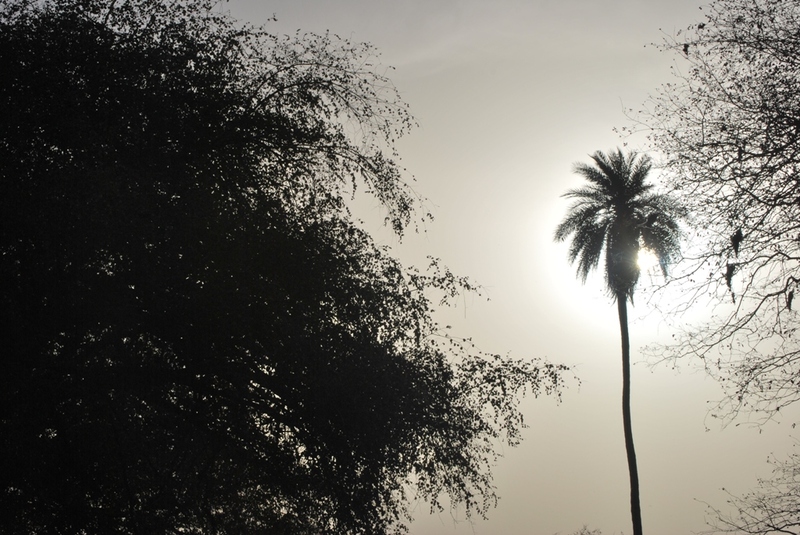 Notice the glint in the eye of the Palm tree. The forest will change colour once again.